The most destructive war in human history, World War II continues to haunt American memory with its stories of suffering, sacrifice, and unparalleled heroism. The wartime experience has also generated a rich trove of historical material, writings, and first-person recollections, which are essential to any appreciation of this most pivotal of historical events. A People’s History of World War II brings the full range of human experience during World War II to life through some of the most vivid accounts and images available anywhere. This concise and accessible volume includes first-person interviews by Studs Terkel; rare archival photographs from the Office of War Information collection; propaganda comics from Theodor Seuss Geisel (Dr. Seuss); oral histories of the Japanese war experience; letters from German Jewish refugees; stories of wartime life from writers such as historian Howard Zinn, civil rights activist Robert L. Carter, Holocaust witness Primo Levi, award-winning poet Charles Simic, and celebrated French author Marguerite Duras; and selections from the writings of some of the world’s leading historians of the “good war,” including John Dower, David Wyman, and Eric Hobsbawm. For anyone interested in an unsanitized view of the war as it was experienced by victors and victims alike, here is the perfect antidote to the “greatest generation” mythology of our own time. 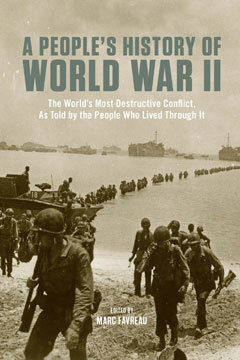 Covering World War II in Europe, Japan, and the U.S. home front, A People’s History of World War II is an important new addition to any World War II bookshelf.